One of the best Sales Conferences in the Philippines to welcome you this year is the Sales Breakthrough Conference. The event is set this March 1, 2019 at Tower Club, Paseo De Roxas, and Makati City. The Sales Breakthrough Conference is a conference to provide you a new and holistic perspective about sales and sales management. Sales are the lifeblood of our organization, without sales there is no growth. It is in this appreciation of sales and the current explosion of different approaches to sales and marketing that the Sales Breakthrough Conference was launched. This topic is all about learning and relearning how to keep the energy and spirit of your sales force up as you set your sight in this year’s achievement of your challenging target. The strategies you crafted during your corporate plan are useless if you cannot sustain the commitment of your sales force. So how do you keep your sales force motivated during the one-year process and beyond is one of your biggest responsibilities. This will be answered during the conference. Before you sell your company products and services you first sell yourself to your target customers. This might be a surprise to you, but this is true. Selling involves establishing your trustworthiness with your client. Having said this, study shows that brands have a bigger value compared to products and services that have no branding. If this were the case, why would you not brand yourself? Definitely, having a personal brand as sales professionals make sense. Increase your value and build your reputation. You will learn more about this during the Sales Breakthrough Conference. B2B selling is probably the hardest type of selling. B2B selling offers a huge windfall from companies involved in this type of selling. In line with this, it is very critical to master the art of B2B selling. Losing a client in B2B selling is more than a black eye. It is a direct and heavy punch to the gut of the salesperson and company that lost the client. We have invited a resource speaker that is an expert, and until now, doing B2B selling in his industry. You can get insights and wisdom from Jojo Clemente III, as he reveals his secrets in how to be successful in B2B selling. Innovation is the heart of progress. In the field of sales, it is very true. The more you create an innovation that adds value to your clients, the more you can get ahead of the competition. Design Thinking is a design methodology that provides a solution-based approach to solving problems. It is an effective methodology in solving the pain points of your clients that encounter obstacles that blocked them from buying your products and services. Design Thinking will show you how to solve these pain points, as you become at ease with the use of design thinking, you will see a huge increase in the number of your clients. When there is an increase of clients, somewhere around the corners is an increase of sales that you are aiming for. The Real Estate Industry continues to grow in the country. There are a large number of sales managers and sales agency in this industry. The growth is expected to extend for many years to come. It is in this environment that the Sales Breakthrough Conference gives special attention to the Real Estate Industry. The industry is governed by trends that are very critical in the sales leaders and sales force action plans. You will learn more of these trends as one of the respected real estate practitioner and sales leader share these trends that will shape the industry for this year. Finally, we present of the esteemed leaders in the sales and marketing industry. Ms. Carmie De Leon, VP for Sales and Marketing, Healthway Medical presents some practical lessons on how to be a sales manager. Sales Management is a daunting task. There are a lot of moving parts that require you as a sales manager to oversee. The devil is in the details. And the most important detail of your job is maintaining the high level of performance of your people. 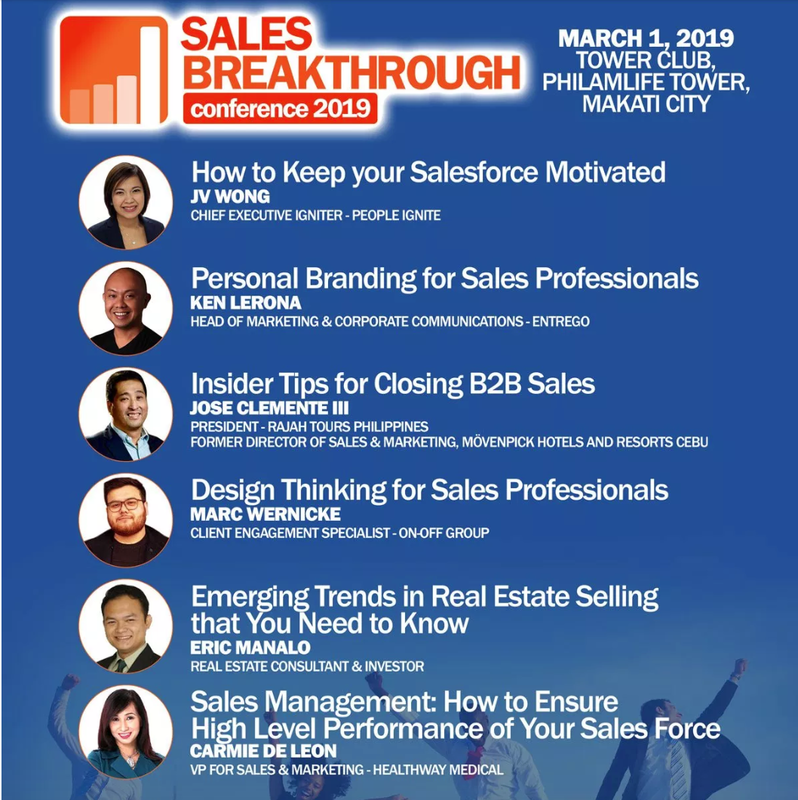 The first speaker of the Sales Breakthrough Conference discuss the topic, “How to Motivate Your Sales People.“ Besides this, our last speaker will show you the science behind maintaining the high level of performance of your sales force. It is an interesting topic that will provide you great insights coming from an award winning leader of the sales and marketing industry. The comprehensive and holistic sales conference will give you a better appreciation of sales and sales management. This will lead you to have a more strategic approach to your selling and sales management. 2. BEST PRACTICES AND NEW STRATEGIES. All resources speakers are expert and successful in their chosen fields. You will learn a lot of best practices and new strategies that you can immediately take into your office and implement. You do not have to reinvent the wheel. All you have to do is copy the success blueprints of the companies presenting during the Sales Breakthrough Conference. When you do, you are off to the races, galloping your way to the success while letting your competition bite your dust. 3. NEW BUSINESS PARTNERS, WIDER NETWORK. Your Sales Breakthrough Conference will not be complete if you will not enjoy one of the best benefits you can have for attending the conference – the new business partners, and business friends that you are set to generate as an attendee. We make sure that you go back to your office gaining new potential business partners and support group from the other delegates. We have designed the conference to give you more talk time with other delegates. For one, you are an expert that has story to tell, and your co-delegates would love to hear that. We too love to hear it from you. So we have time allotted for workshops and networking that will not only make these scheduled time fruitful but enjoyable for you. Seats are running out, you have to call now! The truth is the seats are running out in the Sales Breakthrough Conference. This is a meaningful and affordable learning opportunity that you can have for this year. And those that booked early know it well. So grab you phone, call tel.no. 633-0153 or email info@exlinkevents.com. You may also visit www.salesseminarphilippines.com. Hurry book your slots now before time runs out.